Avocado Chicken Salad. 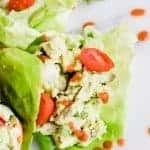 This chicken salad is made without any mayo, just avocado! Perfect for an easy lunch or light dinner! Keep it low carb and fresh by using lettuce wraps. In a medium size bowl add the shredded or diced chicken, red onion and cilantro. In a small bowl mash the avocado, add the salt and garlic powder. Stir to combine. Spoon into the chicken mixture and stir until mixed. Serve as desired and enjoy! Top with diced tomatoes and hot sauce if desired. If cooking chicken to shred heat a medium size pan over medium heat. Drizzle with extra virgin olive oil. Add the chicken and sprinkle with salt and pepper. Cook for about 5 minutes then turn to cook the other side. Pour about 2-3 cups of water into the pan, cover with a lid and allow to cook for about 15 minutes until chicken is cooked through. Remove and chicken will easily shred.